Is AMD's Fusion processor an Intel killer? AMD, the PC processor industry's perennial second stringer, is tooling up to release its long awaited CPU-GPU "Fusion" processor. It has all the makings of an Intel killer, particularly in mobile trim for laptop PCs. Codenamed Llano and due out early next year, key advantages include a single-die fusion architecture and graphics power an order of magnitude greater than any previous integrated solution. About time, too. While Intel rolls out advanced new PC processor architectures on a seemingly weekly basis, the current culmination of which is a six-core monster, AMD is almost nowhere to be seen. Arguably, it hasn't released a properly new processor since 2003. That's about to change. The fight back begins later this month with Thuban, AMD's six-core effort. However, Thuban is just a six-core rehash of AMD's current processor technology. Interesting addition to the meaty mid-range CPU market though it may well be, it won't worry Intel. Instead, it will be Llano that marks AMD's real renaissance and the beginning of a danger period for Intel. AMD has been trickle-charging us with info on Llano in recent months. Turns out it's not quite the chip we were expecting. In some ways it's actually a disappointment. But as an overall package, it's shaping up to be potentially lethal. Crucially, Llano combines a conventional PC processor and a full-function graphics core in a single slice of silicon. Intel, of course, already has a CPU-GPU hybrid processor on sale in the form of its Arrandale and Clarkdale processors. They're sold variously as Core i3, i5 and i7 processors depending on the target form factor, price segment and apparently which way the wind is blowing. There's little logic to Intel's current PC processor branding scheme. More importantly, Intel's CPU-GPU chips are not full-on fusion products. Crack open the CPU package (highly inadvisable if you want to keep using it) and you'll find not one but two individual processor dies. That's Intel's way of getting fusion to market faster and with fewer risks. But it's also architecturally suboptimal. Enter therefore Llano, the real single-die fusion deal and with it the promise of that rarest of things for AMD - a competitive advantage. First up is Llano's intriguing integrated graphics core. It's absolutely huge. Exactly how huge in terms of the all-important stream processor count we can't say for sure. AMD hasn't divulged the hard numbers. However, AMD has teased us with a few photographs of Llano which in turn reveal that the graphics core consumes nigh on 50 per cent of the entire die. We also know that Llano will be built on AMD's upcoming 32nm chip production process and will enjoy a total transistor budget around the one billion mark. Put those facts together and you're looking at an integrated graphics solution with a probable stream processor count somewhere north of 400 units. Not all that impressive in the context of AMD's monstrous 1,600-stream-processor-strong desktop GPU, the Radeon HD 5870. But remember, AMD's fastest current integrated graphics core sports just 40 stream processors. Admittedly, there are doubts regarding Llano's ability to feed that graphics core with data. GPUs are extremely data hungry and it's not yet clear whether the CPU and GPU parts will share a single memory bus and if so what that bus will look like. 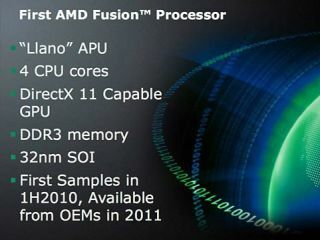 As for the conventional CPU half of Llano, it's based on AMD's current Stars processor architecture. Four cores, each with 1MB of L2 cache and a few tweaks to what is a rather ancient architecture will be your lot. That's a little bit of a bummer given that AMD had originally planned to use a brand new CPU architecture for its first Fusion product.